How to facilitate work scheduling and plan the best possible production flow quickly and reliably! 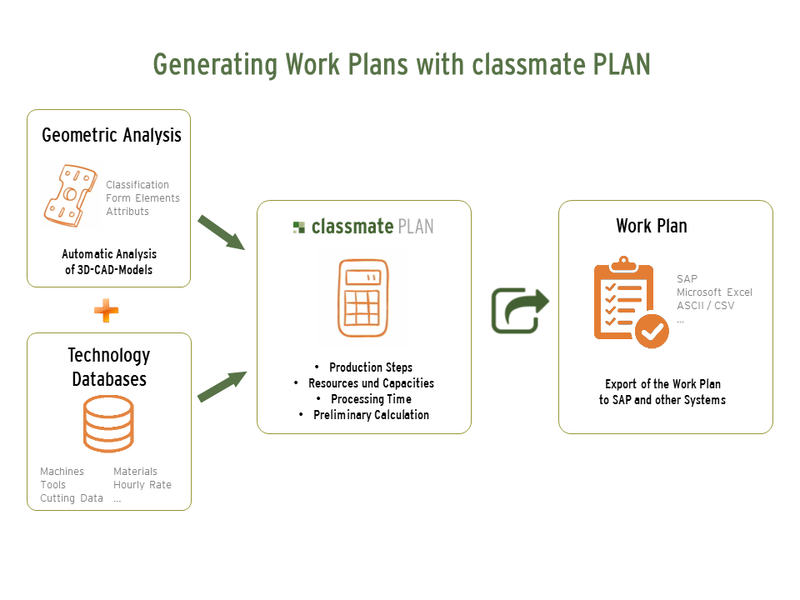 classmate PLAN generates the work plan automatically – but that is not all! In order to prepare the production process in the best possible way, classmate PLAN can be used as an effective tool for preliminary costing and work scheduling. The work plan is generated automatically from CAD data. Transfer errors are avoided by using data from the native CAD model; underlying data is always up-to-date. No work step can be missed. Data calculation in a matter of seconds. Individual work steps can be checked in list form or in the CAD model, so that problematic cases or cost drivers are quickly identified. Various product versions can be compared reliably, e.g. different production sites, suppliers or batch sizes. Your work scheduling is significantly facilitated by taking off standard tasks and gaining time for more complex tasks. Work scheduling and cost calculation can already be performed before the first material/parts master is created. The initial effort for time and labor is manageable and experienced simus project engineers will accompany the process to discuss any issues arising and optimize the result. Extensive templates for machines, tools and machining processes are available. A high level of project security and sustainability is ensured, as new machining processes can be integrated in the software later on. Easy integration in the existing IT landscape. Easy add-on of classmate CAD at a later time for automated classification of CAD models and supporting reuse rate or similarity search, as the same technologies are used. Initially, geometric data is analyzed for the product to be manufactured. All details available in the 3D CAD model as text, geometric information or as product manufacturing information (PMI) are automatically ascertained and can be used for automatic work plan generation. Further manual entries are not required. The rules in classmate PLAN developed by simus systems automatically identify the required working steps, from this information in logical order, e.g. sawing, turning, milling. For a turned part with a nut, classmate PLAN takes into consideration that it makes more sense to mill the nut after turning and not the other way around. classmate PLAN accesses technology databases tailored to your company’s needs, in which information on available machines with their capabilities, tools, cutting parameters, materials, etc. are stored. Various versions can be calculated, e.g. for adding materials or compare production processes for various sites. Companies with a low degree of vertical manufacturing can set up ”virtual“ machine parks for their manufacturing partners. If the users want to set up work plans for a partner in Germany or Asia, for instance, not only can the various cost rates be calculated but the different production methods can also be considered. While the 4-axis machining center could be used for this purpose, different manually-operated and simple machines might possibly be used in China. In a matter of seconds, classmate PLAN determines all possible and useful manufacturing alternatives under consideration of available parameters in the background. The user can now choose which of these alternatives will be used: The one with the lowest planned costs, the one with the fewest machine changes or the one with the shortest cycle times? After calculating suitable machines, tools and production times with the in Germany commonly used REFA method (time study technique for the purpose of determining manufacturing costs), classmate PLAN uses the hourly rates and factors stored in the technology database to determine the manufacturing costs, as well as performing calculations on marginal and full costing. The user not only receives a fully functional work plan and information on manufacturing costs but also which price manufacturing partners need to quote based on full costs or marginal costs. The results can be displayed visually on the graphic interface classmate FINDER. You can save, search for and compare several results. The effects of different structural solutions can be compared, e.g. a steel version followed by zinc coating in comparison to another version in stainless steel, the effects of a fit or a change of radius. All these changes are available in a matter of seconds. The various versions can be performed in the CAD model or, if unavailable, in the Viewer which is integrated in classmate FINDER and provides detailed information. Cost drivers or problem areas can be identified in list view, as well as through an automatic color coding in the viewer model. The most economic or most sensible product version from the user’s point of view can be selected conveniently. The determined sequence of technologies, machines, setup and job times are transferred to a work plan. The work plan and the calculation results can be exported from classmate PLAN to various systems, e.g. Excel or ASCII/CSV via interfaces. A transmission of results to an ERP system is also an easy option. The work plan can be transferred to SAP automatically via a standard simus interface, for example.